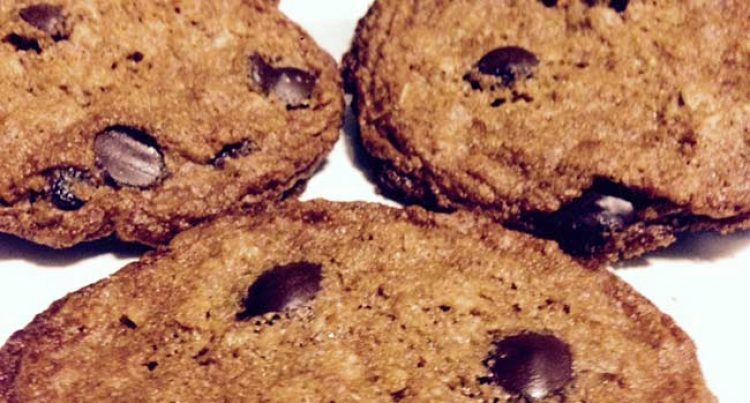 For a long time I’ve searched for a good whole grain chocolate chip cookie recipe, struggling to find something that didn’t produce dry, cakey or puffy cookies. Finally, I found one that I love, that results in thin cookies that are crispy on the edges and chewy in the center. I love to bake them a few at a time and freeze the rest, so warm, fresh-from-the-oven cookies are never far from reach. It’s based on these WOW cookies from Bob’s Red Mill (which are vegan, BTW – my recipe is not). In addition to using 100% whole grain wheat flour and a hearty amount of whole grain oats, it also replaces a lot of the butter with extra virgin olive oil. There is, of course, still quite a bit of sugar, because, these are, after all, still cookies. Moderation, people. They’re a great recipe to try with the Hot Cakes Smoked Chocolate Chips we recently featured. NOTE: it is important to bake these cookies all the way through – with many recipes, I like to undercook them a bit, but that doesn’t work well with these. For best results, cook ’em until they are fully set in the center, let cool for 5-8 mins, then serve w/ cold skim milk. « Hot Cakes Smoked Chocolate Chips	» Waffatopia!